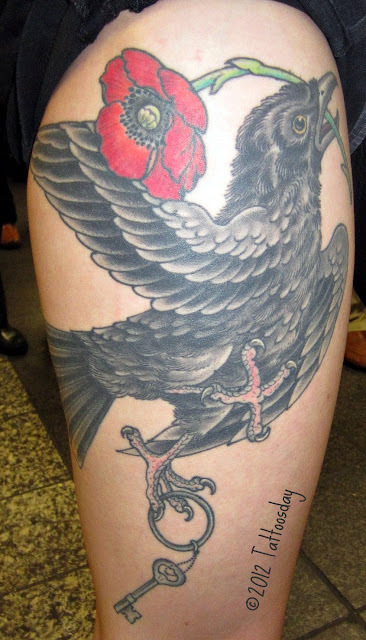 This tattoo belongs to Katya, who I met back in April in Penn Station. This seemed more appropriate to post around Halloween. since it features pumpkins. Katya credits this work to a friend of hers named John Murphy in California with starting this piece, which she conceives as the start of a sleeve, which will rise from the earth and the pumpkins, up her arm to a cityscape and an homage to the television show Bewitched. Thanks to Katya for sharing this autumnal tattoo with us here on Tattoosday! This entry is ©2012 Tattoosday. Part 3 of Tattoo Age's Profile of Mutsuo is Up! I've been really enjoying the current profile of the Japanese tattoo artist Mutsuo, of which the third and concluding part has just gone live on Vice's Tattoo Age series. 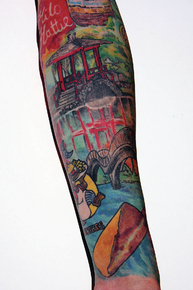 There is a certain Zen quality to this last installment, as Mutsuo visits a Buddhist/Shinto shrine, and talks a little about the acceptance (or lack thereof) of tattoos in Japanese society. You can also click the "Tattoo Age" tag at the bottom of this post to see previous entries. Tattoosday may be a New York City-based blog, but we here at the home office have roots deep in Hawai'i. 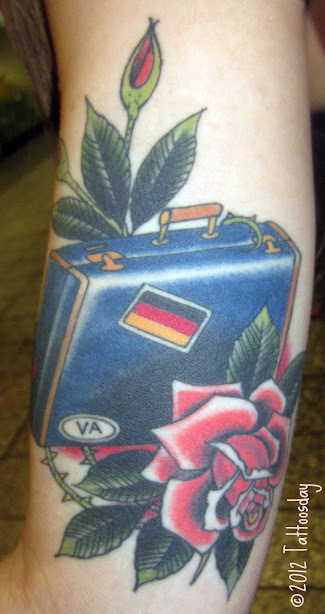 We showed a whole slew of islands-based ink back in our "Tattoosday Goes to Hawai'i" posts back in 2010 (this tag lets you see most of those entries). The full article here details how Savella was inspired by images of people who had Route 66 tattoos. He wanted a similar concept, only with images from the town of Hilo. Among the expected sights, his work also features "...a Big Island Candies dipped cookie ... and a smorgasbord of menu items from Ken's House of Pancakes." The work is credited to local artist John Butler, who is owner and operator of Tattoos by Butler. It's a great article and a nice slice of Hawaiian life for a quick read. I encourage you to check out the piece and see Butler's work on his Facebook page. You may even want to book an appointment on your next trip to the Big Island! Mahalo to my mom for tipping me off and to Savella and Butler for combining forces on this Hawaiian-style project! She credited this amazing piece to Grez at Kings Avenue Tattoo. He is one of those artists whose work I see occasionally in my travels. As always, I am impressed with his workmanship. 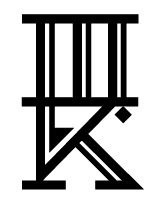 What does this tattoo symbolize? Lindsay explained, "I actually have the key as a necklace of mine that I found in my house and then the poppy is for my grandpa." And the blackbird? She told me, "I like the myths of death behind it." "This is my grandpa's suitcase and I actually found it with the key [from the op tattoo] and it was in the wall of my house. It was really awesome. It's like this really old style suitcase." This is a great tribute to her grandfather and was also tattooed by Grez. Thanks to Lindsay for sharing these awesome tattoos with us here on Tattoosday! I spotted Kara on 7th Avenue back in July. "My arm piece is basically a caricature of me ... I am a marathon runner ... I wanted a pin-up tattoo and I'm a narcissist so I wanted it to be about me ... I gave Augustin basically what I wanted and he drew this." Thanks to Kara for stopping when I asked her about her tattoos, and for sharing them with us here on Tattoosday! 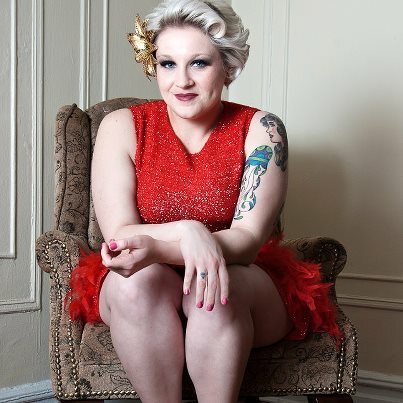 UPDATE: I learned just recently, while researching this post, that Kara has joined the ranks of the many burlesque performers that have graced these illustrious pages. She performs under the name Magdalena Fox and is, by my best estimation, the fifth performer (that I am aware of) that has been featured here. Just one of the fun perks of being a tattoo blogger! You can tell from the photo that Kate has simply incredible sleeves. These and the pistol shown in my convention recap here were tattooed by Becca Roach at North Star Tattoo in Manhattan. Kate explained that this was her first large tattoo and it depicts Marie Antoinette. She told me, "I always felt a connection with good old Marie A, and felt she was an ordinary girl put in extraordinary circumstances." The banner below Ms. Antoinette reads, "l'amour pour moi qui je suis, pas qui vous voulez etre a moi," which translates to "love me for who I am, not for who you want me to be." She credited this tattoo to Jef Wright at Wealthy Street Tattoo in Grand Rapids, Michigan. Can't wait to see the final product! Thanks again to Kate for sharing her work with us here on Tattoosday! Mutsuo on Vice's Tattoo Age (Part 2) - Video Up Today! I know, it's been a long week since we were treated to part one of Vice's Tattoo Age episode introducing us to Japanese artist Mutsuo. The good people at Vice tell us "In Part 2, Tattoo Age delves into the history of Mutsuo's shop, Three Tides Tattoo, and hears from Chris Garver, Masa Sakamoto, and more, as they give us insight into how western-style tattooing gained ground in Japan after the 1999 Tokyo Convention." Now we just have to wait another week for more Mutsuo. As always, this series continues to impress! With last week's double shot of Inkmaster's second season (two episodes for the price of one!) and Tattoo Rescue, you'd think we'd be rolling toward Tattoo Reality Overlord. Although it appears Tattoo Rescue was a one-off pilot, we will now get a new series premiering tonight after Inkmaster. For those in the tattoo industry who think that "reality" shows exploit their industry and that no new tattoo shows is a good thing, they will likely cringe at the title of Tattoo Nightmares. But, similar to a TLC series I spotted over the summer called America's Worst Tattoos, the new series highlights artists who are trying to correct tattoos gone bad. "Real people with really bad tattoos, ranging from hilarious to downright disturbing, seek the help of three of the best cover-up artists in the business to fix them – Tommy Helm, Big Gus and Jasmine Rodriguez. The stakes are high as the regretful clients ... see if the artists at Tattoo Nightmares can work a miracle and turn their disaster pieces into masterpieces. Reenactments allow us to see how the bad ink was born." The way I see it, you're either a fan of these types of reality shows, or you're almost violently against them. Personally, I'm a tattoo half-full guy. For the most part, these shows are entertaining - just on the basis that they are legitimately trying to show a positive side to tattoos. One of the three artists behind Tattoo Nightmares is New York's Tommy Helm, who was one of the three finalists in the first season of Inkmaster. He's a top-notch artist, so I'll give the show a chance based on that alone. Look, when show's like Here Comes Honey Boo-Boo draws millions of viewers, it seems silly to complain about a tattoo reality program that celebrates an art form and arguably helps the tattoo business. The same people who complain about these shows are likely also going to be taking appointments from clients who are inspired by these "tattoo nightmares" and seeking high-quality cover-ups. 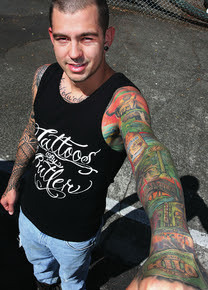 Tattoo Nightmares premieres tonight on Spike TV at 11:00 and 11:30 PM. Sometimes I hang on to the great tattoo photos for a rainy day. Well, it's not rainy today, but I thought I'd release these portraits from Kate, who I was fortunate enough to meet in Penn Station back in May. Kate credited the work to the phenomenal Tommy Montoya (one of the artists from N.Y. Ink) out of Inkslingers L.A.
Billie Holliday and James Dean. Thanks to Kate for sharing these amazing portraits by one of the best in the business! As regular readers may now, we occasionally review tattoo-related books here on Tattoosday. We're going to try and make this a regular Saturday occasion as we enter the colder weather and try to make our summer backlog last as long as possible. 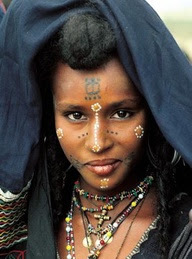 Today's book is Painted Bodies: African Body Painting, Tattoos, and Scarification by the award-winning photographers Carol Beckwith and Angela Fisher. Published by Rizzoli, this beautiful book offers up large and colorful photos en masse - highlighting a wide range and variety of body art adorning African tribes. I will concede, the 288 pages of mostly full-page photographs are specific to body paint, there is one chapter that focuses on tattoos and scarification. That said, this is not the book for someone looking for an expose on African tattooing. However, I paged through this volume transfixed, amazed at the simple beauty of the patterns and color utilized by the tribal artists documented with great respect for its subjects. Beckwith and Fisher have been photographing the indigenous people of Africa for decades and have produced several volumes over the years that have celebrated the diversity of cultures on that continent. This large coffee table-sized book, which retails for US$100.00, but is discounted through Amazon.com, at least at the time of this writing, takes great care to not only document the different body-painting styles of numerous tribes, but to also describe in chapter prefaces, the processes and cultural significance of the techniques. Although technically not a tattoo book, I still believe this would be a valuable addition to anyone's library, whether it is utilized as a sourcebook and inspiration for artists looking to the roots of body art, or as an appreciation of one section of humanity's embrace of the earth and human expression. I would recommend, if anyone is interested in the work of these photographers, to head over to this National Geographic website, where one can learn more about Beckwith and Fisher, and see more of their amazing photos. This review is ©2012 Tattoosday. All images and excerpts are ©2012 Carol Beckwith & Angela Fisher. Back in June, I rode my bike out to the Coney Island boardwalk and did a little inkspotting. One of the several tattooed individuals I met was Tom, who had some cool work to share. Among the designs from which Tom drew inspiration were Escher's "12 Birds"
Tom credited his artist Haun Duong, located in Queens, with this work. The falcon and the snake represent the good and the bad within him. Thanks to Tom for sharing his great work with us here on Tattoosday! I really want to recommend the Tattoo Age series on Vice. The truth is, I ignored it last year because two of my favorite tattoo sites announced when new installments appeared, so I didn't want to seem to be copying them. This mindset was a bit of a disservice to any readers who did not frequent those other sites as well. I just watched the first installment of the second featured artists this season on Tattoo Age, and it's just so well-done, I can't say enough. The featured artist is the Japanese tattooist Mutsuo, who works out of Three Tides Tattoo in Osaka, Japan. 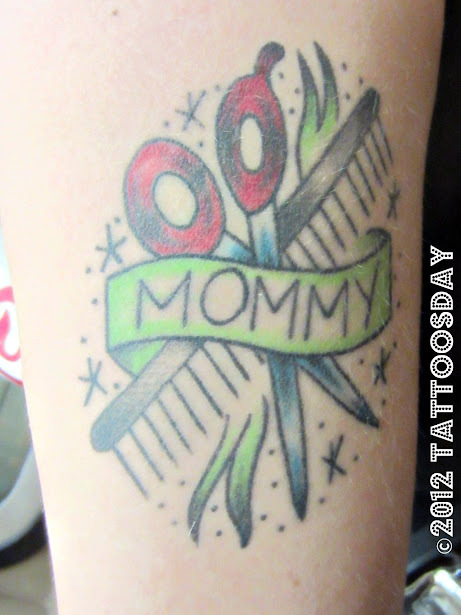 This blog entry is ©2012 Tattoosday. If you're new to Tattoosday, you may not know that I was a "human canvas" on the second episode of Ink Master's first season, which aired earlier this year in January. 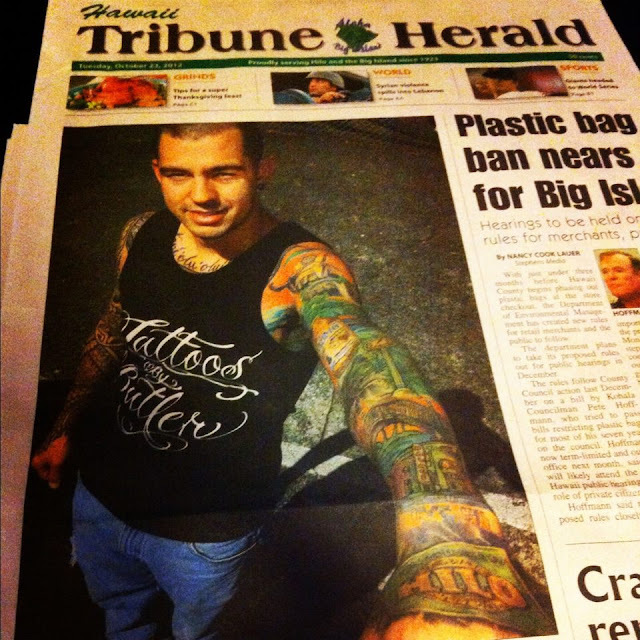 My tattoo (and accompanying story) appeared here. I know there's a lot of hand-wringing about "reality" tattoo shows, but my position is this: if there's a chance to see quality tattoo work on TV, I'll watch it, even putting up with the drama, real or not. Like in the first season, there are some artist competing who I've never heard of. But there are also those whose work I have been fortunate enough to feature here on the site. Most notable is Lalo Yunda of Sacred Tattoo. Lalo's work has appeared on Tattoosday the most, which makes sense since he is a New York-based artist. His work appeared most recently here and here. 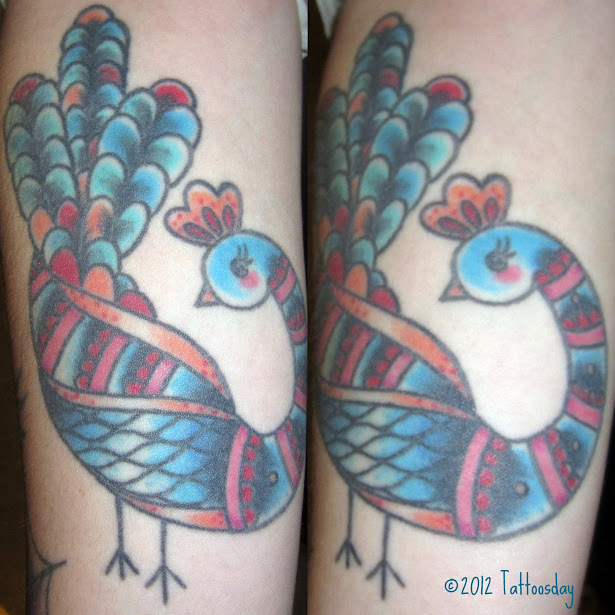 There'a also Katherine "Tatu Baby" Flores, whose nickname has raised eyebrows among more serious tattoo enthusiasts. I do know know that when I featured one of her pieces late last year here, I was impressed. Since last year's winner, Shane O'Neill, had also appeared on Tattoosday here and here, I'll go out on a limb and predict that Lalo Yunda will be this season's winner. Call it the Tattoosday blessing! Be sure to check it out (or at least DVR it) and remember, if you're looking for the episode I was in, it was called "Botched Head Tattoo". 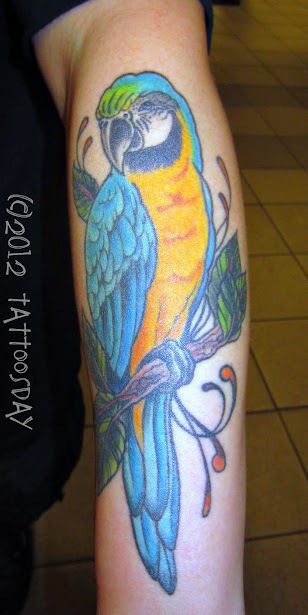 Millie credited the artist Wendi Koontz at Rising Dragon Tattoos in Manhattan with creating this beautiful macaw. As parrots go, it's quite spectacular! Thanks to Millie for sharing this great tattoo with us here on Tattoosday! Today's tattoo comes to us courtesy of Nick, who I met in Penn Station back in May. He explained that this piece on the inside of his arm was done by two artists. The first part of it was done by "a friend of a friend in his apartment." "...I had just turned eighteen and I haven't seen him since then and I had it touched up by another artist's shop in Syracuse, New York [Mike Haines at Scarab Body Arts]. He was a tattoo artist there for a very short time. ...I'm a sociology major and I'm a Libra so I have the scales for the Libra and justice and balance....[the] brain outline is taken from a book, Prometheus Rising, out of one of the chapter beginnings ... [the] image of three women holding it up is actually from the artist's stamp collection of almost like a three graces depiction of them doing various things ... I kinda view it as these three women are Society to me, and they hold up ... my brain and how I think ... and it's all masked by my interpretation as a Libra in this world." As to how he originally got the piece, Nick said "it originally looked like a prison tattoo, I'm not gonna lie. The guy who did it, I didn't look at his portfolio, really. So, the guy who touched it up [Mike Haines], he actually did a great job of filling in the shadow to kind of smooth out the rougher edges that were originally made into it...". Thanks to Nick for sharing this cool tattoo with us here on Tattoosday! UPDATE: Nick followed up with me and wrote, "Mike Haines ... left Scarab Body Arts shortly after my tattoo and started his own business called BioGraphix Tattoo in Syracuse." One of the perks of randomly going up to people with interesting tattoos is that I have, over the years, met several burlesque performers. Whether it be Annie Cherry from Kansas City, or NY-based performers Legs Malone and Miss Clams Casino, I occasionally find myself in the presence of some very talented artists. Case in point, this summer I ran into a woman on the subway with a diamond tattooed on one of her knuckles. 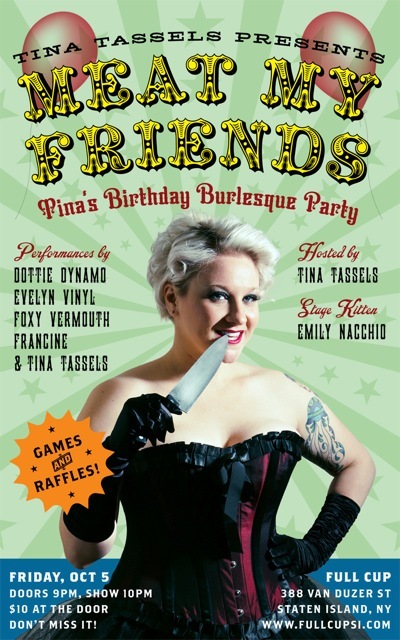 Although I didn't photograph it, we stayed in touch and I learned that she was none other than Tina Tassels. When I first met Tina in the spring, her arms were covered, so I didn't get to initially see the three pieces on her arm, but I subconsciously registered them. A few months later, in the middle of the summer, when I sat down on the train next to a pink-haired lady on the subway, I recognized the work, but couldn't remember where I'd seen it. After five years of inkblogging, such things are hard to instantly recall. This may not be the best of Tina's tattoos, but it was her first, and it is near and dear to her heart. She pointed out that it says Mommy instead of Mom, because she was concerned with how her mother would react to her getting her first tattoo. "Basically," Tina told me, "it was my first tattoo to butter her up." The scissors and comb represent the fact that her mom is a salon owner and as Tina explained, "that's what I associate with her before anything ... she's a hard worker." 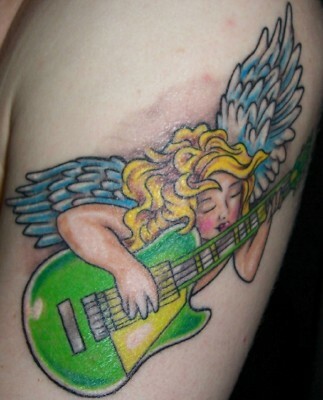 Tina had this done in 2009 by Derik Snell when he was at Hand of Glory Tattoo in Park Slope, Brooklyn. Derik now tattoos out of Flying Tiger Tattoo in New Britain, Connecticut. I have a Derek Snell design (inked by Brian Faulk) as well (documented here) and his work has also appeared on Tattoosday here. I want to wish Tina a happy birthday and encourage people to check out her blog, Big Hips, Big Dreams. She's also performing in honor of her birthday tomorrow on Staten Island at the Full Cup! Thanks again to Tina for sharing her tattoo with us here on Tattoosday! Have a Happy Birthday Tina! Felicia credited this to an artist named Thor at Three Monkeys Tattoo in downtown San Diego. I wasn't able to track down either the artist or the shop, so I may have misheard, but I guess that's beside the point. In the end, we have an original peacock that differs from a lot of the more realistic attempts at peafowl we have seen in the past. "I told you I'd send over my favorite tattoo, which I had hidden under tights at the time. See attached for a photo of the tattoo after it was freshly done [top], and then a photo of what it looks like now [bottom]. This is the cover art for the film Suspiria, one of my all time favorite horror movies. 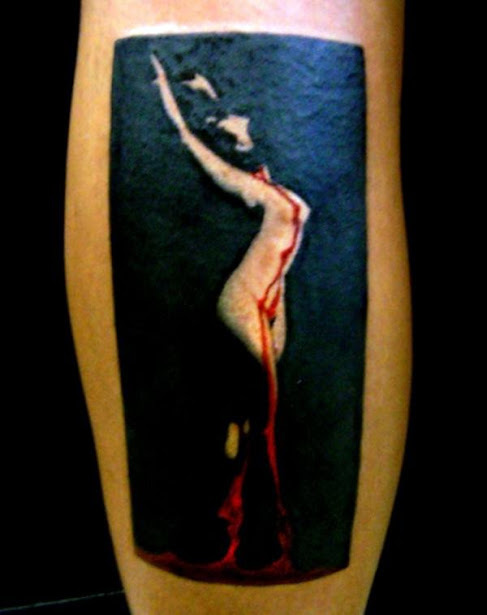 I came up with the concept of creating a blackout piece behind my calf, and decided Suspiria was definitely a film worthy enough to cover such a large amount of space." 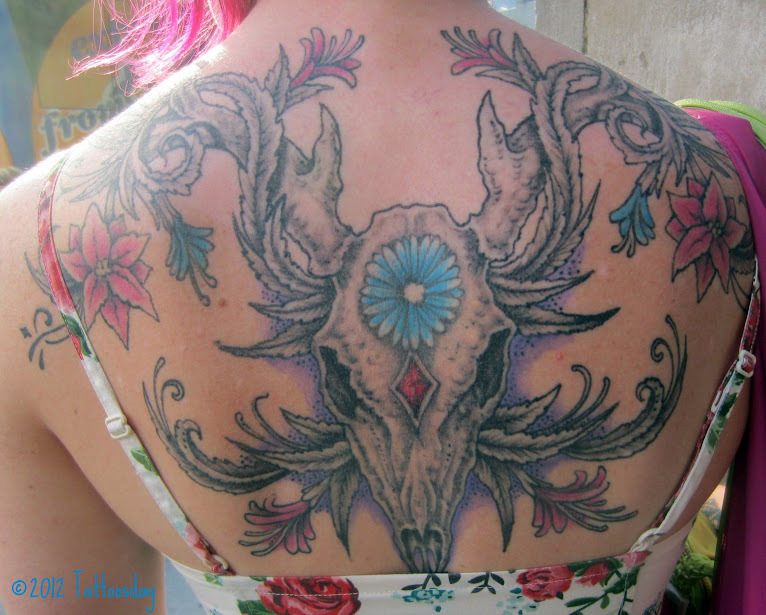 Thanks to Felicia for sharing her work with us here on Tattoosday!